So what's the best thing about ample Florida sunshine in the garden? Flowers. Yes, enough light to grow a variety of flowers. I refuse to grow fussy flowers though. The plants (trees, perennials, shrubs) in my sunny garden that produce flowers absolutely must survive on mostly rainfall. During the driest season (spring for us;some winters), once in a great while, I turn on my irrigation. Only when a dry spell twists my arm and forces me do it. 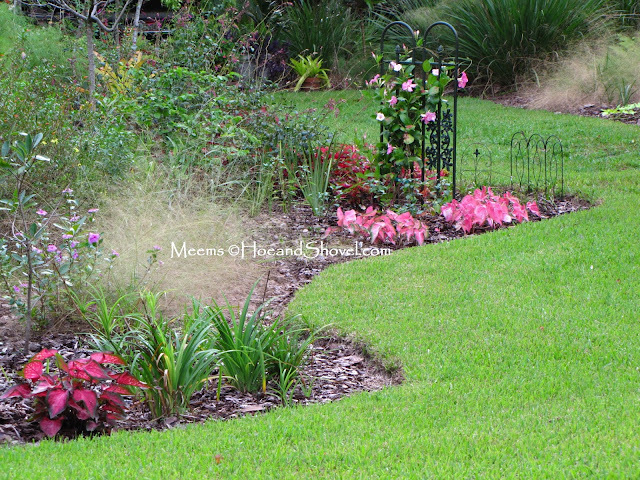 Did you know your garden will adjust to less water than you think it needs. Over-watering teaches your plants to demand more. Gardening with an abundance of sunshine is all new to me. My previous garden was mostly shady in front and back. This garden has an open area in the center; between the trees situated along the perimeter. That gaping hole allows morning sun, midday sun, and afternoon sun to stream down in hot, dry, glorious rays. Good for growing flowers and foliage I used to only dream about. There's a story about these daylilies. You know I have a story about most of the plants in my garden! I'm sure you do also. Because every plant means something. And some plants mean more than others. And the backstory of design and thought and reason is just as important as the result. 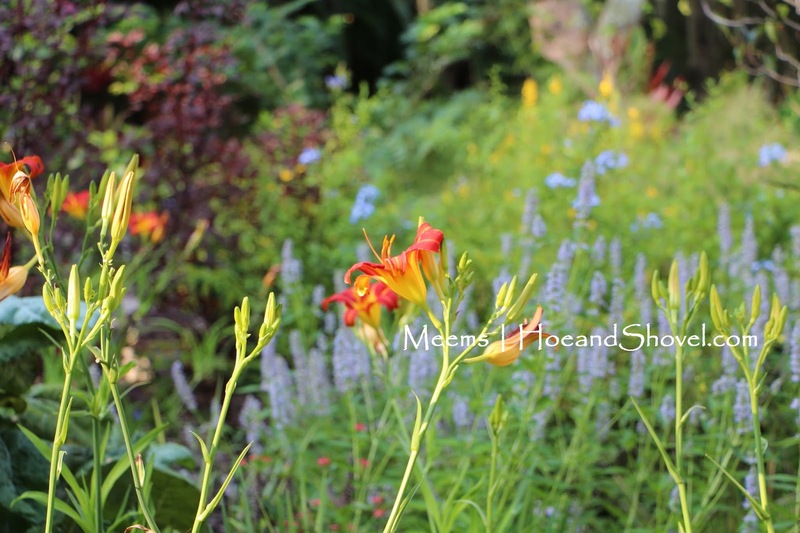 So about those brightly colored burnt orange and yellow daylilies ... from my house next door I noticed them flowering each year. 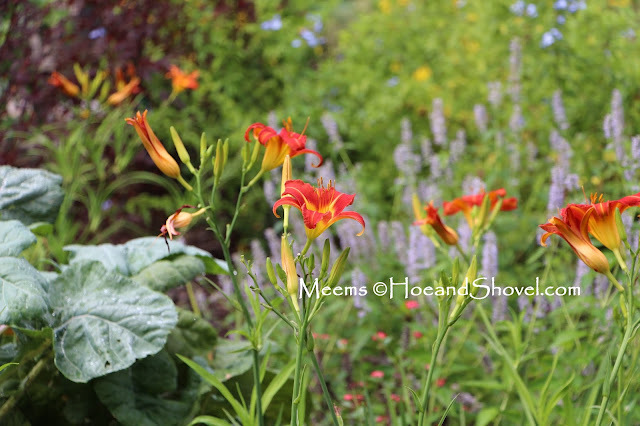 They especially caught my attention because I didn't have enough sunshine for daylilies to flower sufficiently. They were planted in a rather insignificant clumping fashion with no particular style, yet they were faithful to flower. It was clear to me they were an old, reliable variety whose scapes tower high above the evergreen strappy foliage. 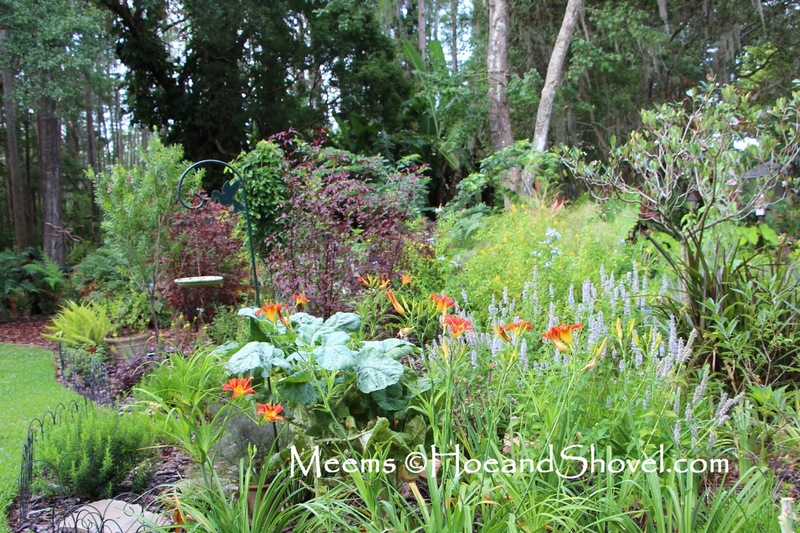 An old photo from August 2014 soon after I transplanted the daylilies (that's them in the front). The sunny garden has four sides because it is in the center of the garden. This is the angle facing northerly. This angle is from north to south across the width of the back yard. Due east is to the left of the plantings in this photo. When I dug out more grass in the back last year I placed the daylilies in a more prominent position than they originally held. I divided them, spread them out, and multiplied them by planting the little plantlets they produce when they are finish blooming. They've adapted well and now they are blooming their big burnt orange heads off. They mean a lot to me because they belonged to my previous neighbor. 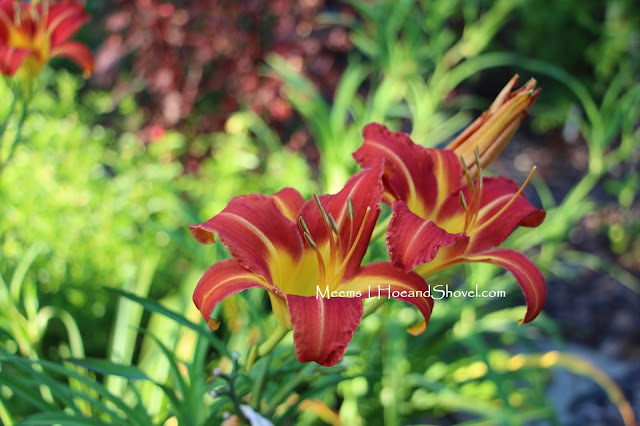 That's the daylily story that makes me smile every time I see them. I'm pretty sure they are smiling back at me in all their bright glory. In this sunniest section of the garden I've included a mix of tough Florida natives and suitable Florida-Friendly plants. Right plant- Right place is the key to sunny gardening. It's the key to ALL successful gardening. Most of the plants I chose flower during one season or another. What fun it has been to have this new experience. A partial list of the suitable plants includes Bulbine frutescens 'Yellow Rocket', crown-of-thorns (Euphorbia milii), Louisiana irises 'Sinfonietta', African irises (Dietes vegeta), native grasses (Fakahatchee and Elliot's Love), Pentas, Agastache, Thryallis, plumbago, roses, red bottlebrush tree (Callistemon), Indian Hawthorn 'Majestic Beauty' trees, powderpuff tree (pink), dwarf powderpuff, dwarf bottlebrush (Callistemon Citrinus 'Little John'), Allamanda, maple-leaf hibiscus 'Mahogany Splendor', Calamintha, Pineland Lantana (not invasive), swamp sunflower (Helianthus angustifolius), perennial peanut and lion's tail. 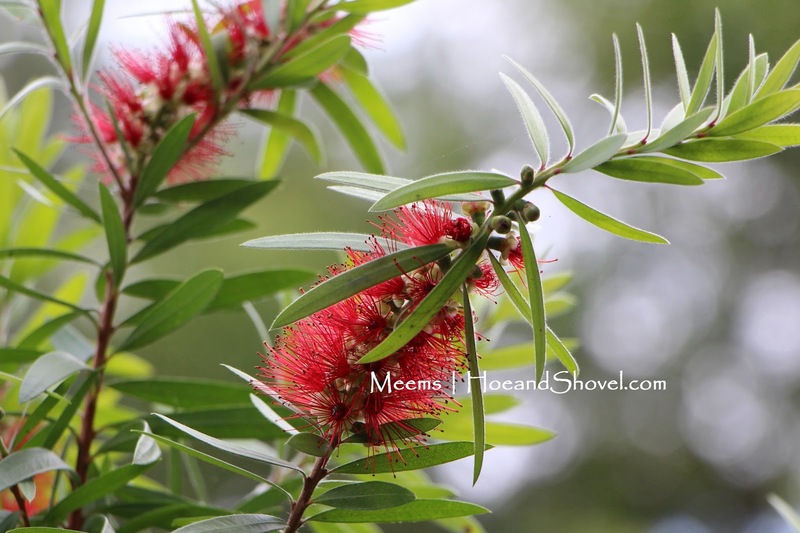 Standard bottlebrush tree I moved from my other garden. It never bloomed there. For 4 years. Why? Not enough sun. Okay, there's more. There really is. 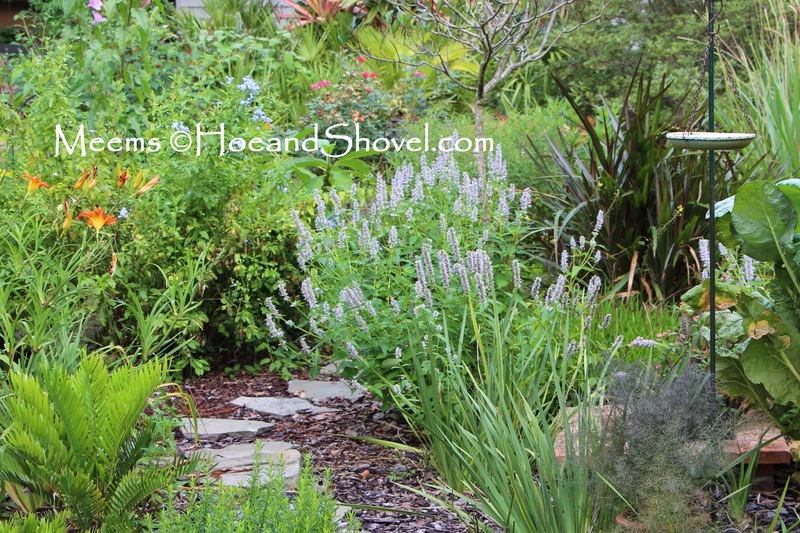 'Wendy's Wish' Salvia, coonties, Rosinweed, cat whiskers, cross vine 'Tangerine Beauty' (Bignonia capreolata), African blue basil, Celosia 'spicata', Fringe tree (Chionanthus virginicus), Coccinea salvia, blackberry lily, scorpion's tail, Carolina aster, St. Bernard's lily, spotted beebalm (Monarda punctata) and of course there are sun-loving Caladiums. That's not all, but I'm sure I've lost you by now. I didn't even realize how many different plants I had planted until I started typing. Whew! I've been busier than I thought. Do you know what might be even crazier? Most of these plants came from my other garden by way of small rooted cuttings or divisions or transplants. Several of them were pass-along plants from gardening friends and neighbors. I've only purchased a very few in this part of the garden. Now that's been super exciting and those gifts from others has added to my sunny gardening fun. When we first moved here I was actually thinking I would add trees right away. A little time to mull over the space, observe it for a while, start getting the feel for the lay of the land and I changed my mind. Those factors along with the challenge of figuring out how to make it work was all I needed to determine I'd leave that wide open spot for the sun to beam down from the sky. 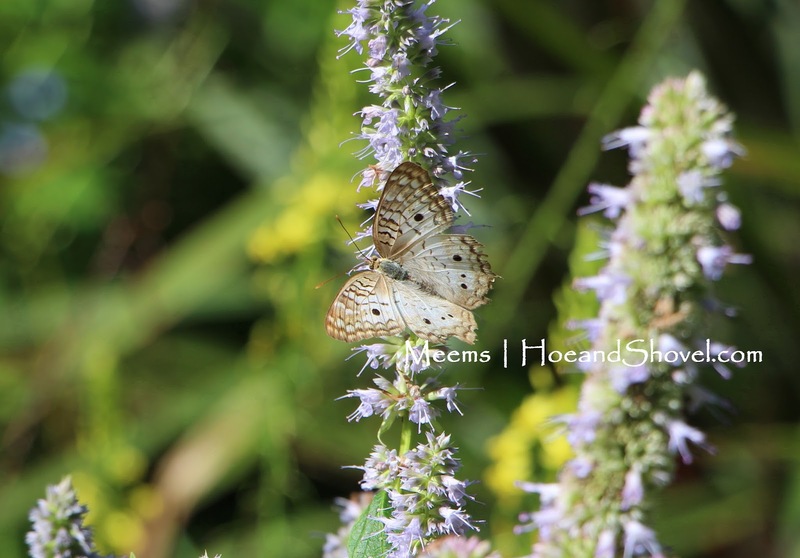 Butterflies thrive in the sunny garden. 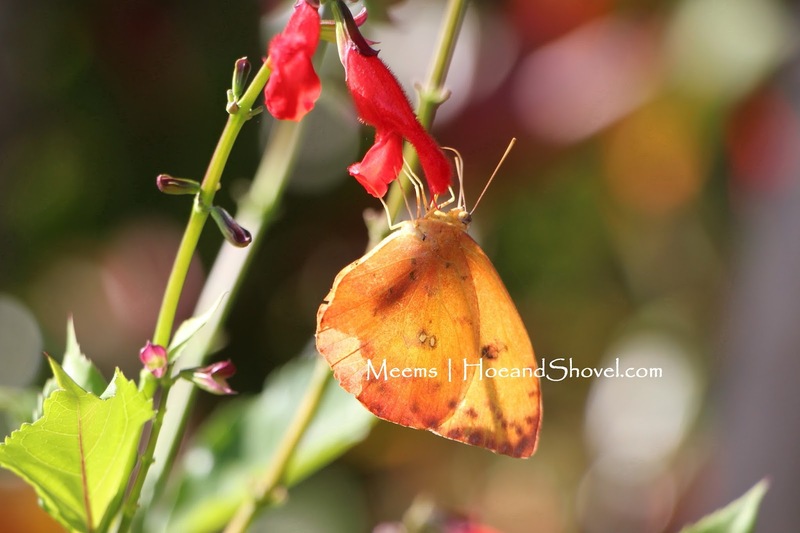 There are hosts plants and nectar plants throughout my garden. I've had a blast learning to plant and tend my new sunny garden. I try to make sure I work there early in the morning or late in the evening. It's excessively hot once the sun comes out. Timing is everything for gardeners. If I work it at the right time the work there is just as enjoyable as tending the shadier parts of the garden. What's blooming in your sunniest garden this late spring? 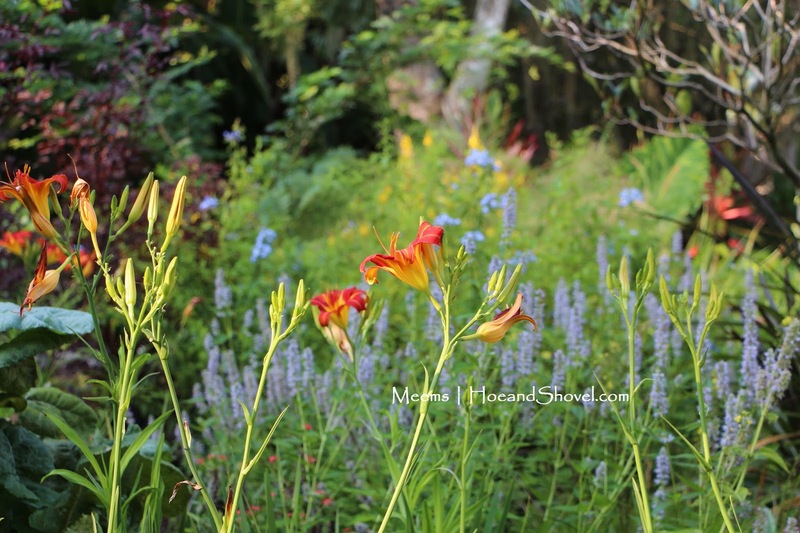 Really good article about Florida native plants. I wish there was more articles like this. Good job! Thank you, Dan ... I'm glad you liked it. Great post! I loved your story about the orange daylilies and about your new gardens. Thanks for taking the time to share it here. Thank you. Gardens are filled with stories and you are well aware, Lorraine. That was one of the hardest things about leaving my old garden. I felt like I was leaving all those stories behind. It turns out that I brought many of them with me by building this garden from divisions, tranpslants and cuttings from that garden. It will never be the same garden and I'm okay with that. 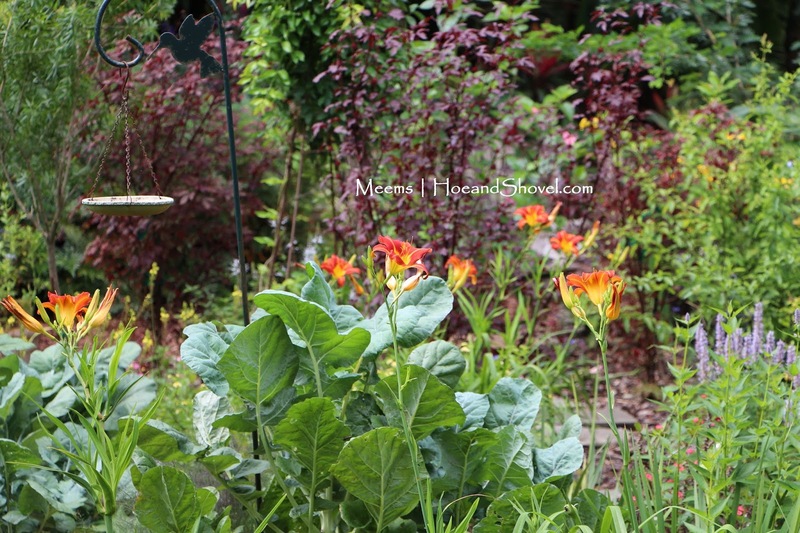 This garden has its own beautiful stories... and there are many more to come. Ooooh, first let me properly thank you for 2 posts in one week! Whoo-hoo! Your sunny garden agrees with you. Love the befores and afters, so rewarding to see your hard work looking so stunning! You have wonderful design sense. Be glad in it. Not all of us are blessed with it. Enjoy your new sunny and spectacular space. You are too funny Daisy. You're welcome. 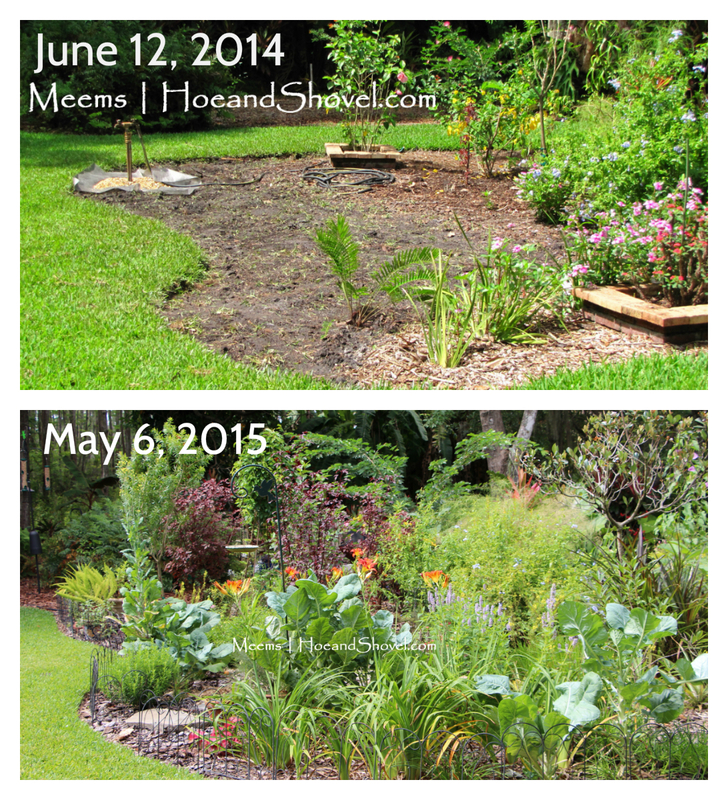 I have so much catching up to do with before and afters. I've truly enjoyed the challenge of this new design ... more than I ever would have dreamed. I'm content where I am and look forward to each day in this garden. I love your story about the daylilies. They are such beautiful flowers, so that's great that they survived the transplanting! I've sort of done the same thing. My old garden wasn't particularly sunny, but this house was a new build, without a tree in sight. Even 11 years later, the trees we did plant are still small, so I've learned to love sunny gardening. In particular, I've come to realize that the best part of full sun gardening has been that my butterflies much prefer it this way! Looks lovely. Am wondering, what is a beadboard? Have not heard that term before. I love your blog and gorgeous pictures.